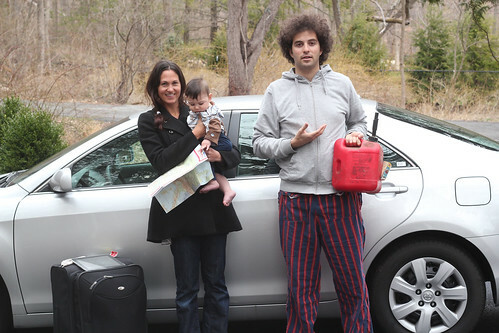 Levinson Family Road Trip, a photo by happyjoelmoss on Flickr. We spent 2100 miles driving from Miami, Florida to Providence, Rhode Island because I thought it would be good for a video contest to make a road trip song about Animal Crackers. It turns out, that was one of my silliest ideas ever. Poor 5-month old baby. Poor mother to a 5-month-old baby. I owe them both BIG. The good news is we saw relatives (WASHINGTON DC!) we saw some beautiful cities (CHARLESTON, SOUTH CAROLINA!) we ate some excellent food (RICHMOND, VIRGINIA!). The bad news is only about 2 days after the contest ended and they’ve already announced finalists, and our Levinson Family Road Trip video was not among them. Shucks. Also, I’m pretty sure my wife will not be letting us take another road trip for at least a few years.